With the HBO Bryant Park Summer Film Festival presented by Bank of America less than a week away, it's time to start packing those picnic baskets, and making plans to meet your friends in the park for our first film, One Flew Over the Cuckoo's Nest. Last year, we implemented a new entrance plan for festival-goers. This year, those rules will remain relatively the same, but in case you missed it, here are the highlights once again. Can I get to the park early and save the best seat on the lawn? Yes! We love the ritual running of the lawn. 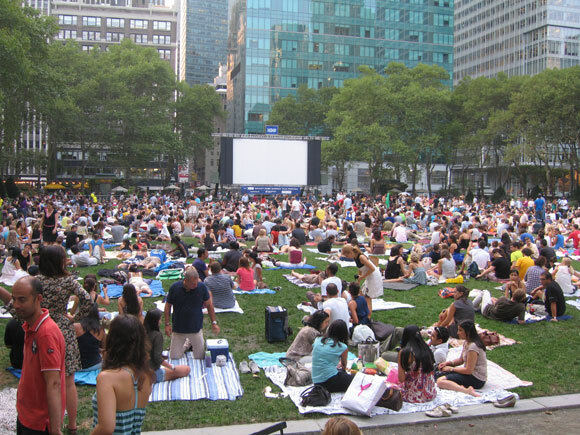 The lawn is usually closed on Mondays, leading up to the Film Fest, so it can rest in preparation for the crowd. At 4pm, we'll allow people to enter the gravel area around the lawn. The lawn will open at 5pm. Seating is first-come, first-served. Films start thirty minutes after sunset, once it is dark enough to see the projection on the screen. The exact time of sunset changes as the summer progresses, but films generally start between 8:30 – 9pm. How do I access the Lawn? We invite you to enter the Lawn Area from both sides of the Fountain, which is closer to the 6th Avenue side of the park. Can I use a chair on the lawn? We ask that you sit on a blanket instead, so everyone behind you can see the screen. Bike parking is available inside the park at the Pétanque Courts. 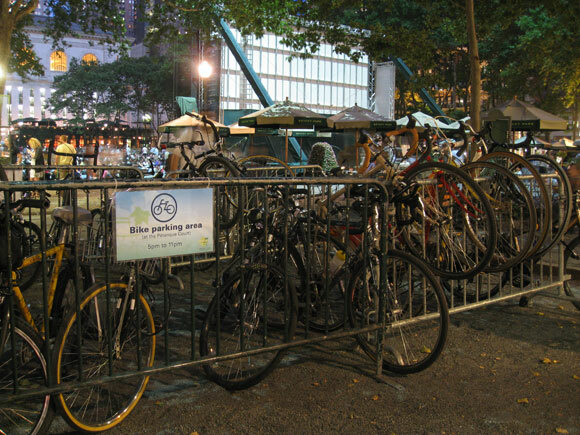 Bikes chained to the park's perimeter fence will be removed. Why can't I use my plastic tarp on the lawn? After you sit on the lawn for several hours, a lot of heat is created between the plastic sheet and the lawn. This will burn holes in the grass, leave brown spots, and make the grass unpleasant for the rest of the season. Cross your fingers, because after all the irrigation work we did this year, the lawn should dry more quickly. I only brought a purse. Do I have to wait for my bag to be inspected? Yes, all packages, bags, briefcases, backpacks, knapsacks, gym bags, shopping bags, etc. are subject to search. What if I leave the Lawn Area to get food? Packages, including food bags, are still subject to search when you re-enter the lawn area. But this year, there's no reason to even leave the lawn to purchase food. 'wichcraft will make your life a lot easier by selling their famously fresh snacks inside the security checkpoint. 1) Bryant Park Bathrooms on 42nd Street are just down the stairs from the Upper Terrace. 2) Additional porto-san facilities are located on 40th Street on Monday nights. Sorry guys, as a courtesy to women, the Bryant Park Bathrooms are for women only after 7pm. Bring an umbrella! Since we do not have rain dates, we always try to screen the film. If there are unsafe weather conditions like lightning, the film will be canceled. This hasn't happened since 2007. 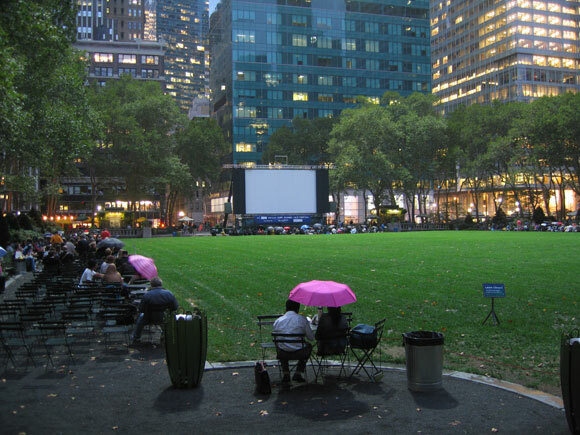 We are usually able to screen the film in the rain, but ask visitors to remain off the lawn when it is wet. And perhaps the most exciting news of all, Director Milos Forman will introduce his film this Monday live in the park. We hope you enjoy the show!